When I say easy, I mean EASY! 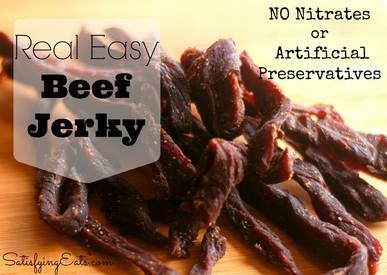 Beef Jerky has always been our go-to snack for long trips but the ingredient list always left me hanging my head in shame! Now, after making my own jerky, I profess that I will NEVER buy it again!! Not only will I save myself from eating soy, trace amounts of wheat, msg, corn, flavorings (whatever that means) and chemical nitrates, I will save LOTS of Money too! !